For her to back-to-back appearances, Ananya picked sparkly mini dresses to wear. While at her movie’s song launch, she was photographed in a dress by Needle & Thread. And for her appearance at a soirée later that evening, she picked a dress from H&M’s ‘Conscious Collection’ to wear. While neither look was really memorable, Ananya did wear both dresses well. 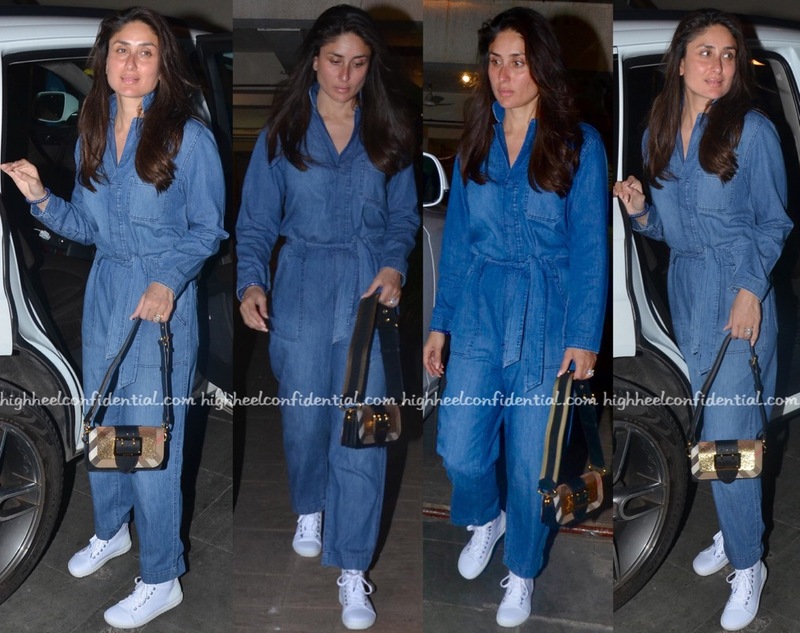 While out and about in Mumbai, Kareena was photographed wearing a denim jumpsuit from H&M. Sneakers and a Burberry bag were among her choice of accessories that evening. The bag didn’t quite work, and a ponytail would’ve helped finish out the look better, but as is, Kareena’s off-duty look was bit of a miss. Kareena taped for Arbaaz Khan’s radio show on Friday wearing a Dsquared² knotted up shirt with H&M contrast stitch denims and pumps. Lemme repeat that again, a knotted up shirt with contrast stretch denims and pumps. Are you scratching your head too looking at her? For a recent appearance of hers, Madhuri kept things simple in high-street separates- a Marks and Spencer cami and pair of H&M pants. Her accessories of choice included gold-toned hoops by Misho.